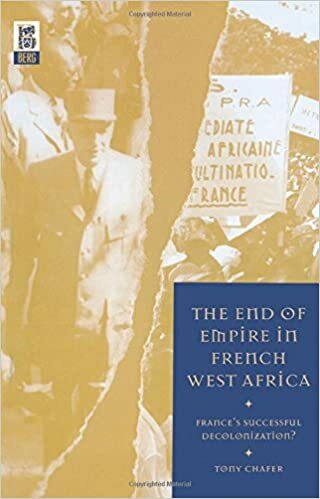 The End of Empire in French West Africa: France's Successful Decolonization? In an effort to restore its world-power status after the humiliation of defeat and occupation, France was eager to maintain its overseas empire at the end of the Second World War. Yet just fifteen years later France had decolonized, and by 1960 only a few small island territories remained under French control.The process of decolonization in Indochina and Algeria has been widely studied, but much less has been written about decolonization in France's largest colony, French West Africa. Here, the French approach was regarded as exemplary -- that is, a smooth transition successfully managed by well intentioned French politicians and enlightened African leaders. Overturning this received wisdom, Chafer argues that the rapid unfurling of events after the Second World War was a complex , piecemeal and unpredictable process, resulting in a 'successful decolonization' that was achieved largely by accident. At independence, the winners assumed the reins of political power, while the losers were often repressed, imprisoned or silenced.This important book challenges the traditional dichotomy between 'imperial' and 'colonial' history and will be of interest to students of imperial and French history, politics and international relations, development and post-colonial studies.